Located in one of Berkeley's favorite and best neighborhoods, this beautiful and rare, second story, fully-furnished 3-bedroom flat offers luxury living and suitcase ready amenities for your Bay Area vacation stay. Walk to UC and to some of California's best eating establishments. Walk to BART and all public transportation. 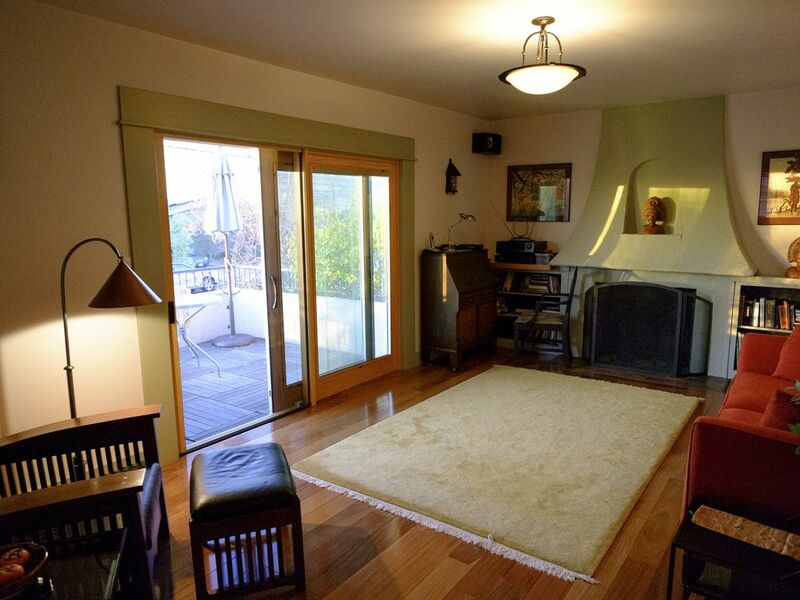 Our lovely flat is located high atop a North Berkeley hillside, with quiet country-style living and views of Berkeley's magical hills as well as San Francisco Bay. Surrounded by lush gardens, rolling hills, tree tops, and panoramic vistas, you can experience the very best of California's Mediterranean climate. The flat is furnished with comfort and quality in mind with all linens, towels and basics for your stay. Off the tiled entry, the richly designed living room looks out through double wooden sliding doors onto the west balcony. The living room opens into a full dining room, furnished in Asian antiques and accommodating a bar connecting the full kitchen, dining room and living room so you can enjoy rich tree-top views from any room. The kitchen is finished in beautiful tile, granite, hardwood cabinets, copper light fixtures and a complete array of culinary supplies for cooking enthusiasts. All appliances are stainless steel, reflecting an elegant European style mixed with Northern Californian tranquility and tradition. Off the dining room there is a lovely, sunny eating area, facing the southeast with a gorgeous view of the University of California and the Berkeley hills. The flat has 2 full baths, both with European porcelain, tile, stainless and glass fixtures. There is a master bedroom with a queen size Japanese platform bed, a second bedroom with a full-size futon, and a study with a beautiful and extremely comfortable full-size sofa-bed-- sleeping 4 very comfortably. The flat comes with a complete stereo system, wall mounted Bose speakers, 3 flat screen HDTVs, DVD/CD players, alarm clocks, wireless Internet access, and full phone service. Off the east utility room with gorgeous views, you have the east redwood deck with bistro seating and direct sunlight all day long. There are, indeed, too many amenities to name. Our flat in North Berkeley is centrally located for easy day trips to San Francisco, the wine country, Pt. Reyes National Seashore and all other Northern California attractions. We take great pride in providing the highest level of hospitality and service. We look forward to meeting you! Our beautiful duplex home has been Suzy's home her whole life, as her family moved here in 1950. Suzy has been a life-long gardener here in Berkeley and Arun has divided his time between a teaching career at UC Berkeley and as a fashion event photographer for Getty Images. Sierra Street is a special place. All our visitors have recognized its unique hilltop beauty and serenity, a neighborhood rich in families and Berkeley tradition, feeling country-like, but within walking distance of all that you will ever need or want to do during your stay. Having rebuilt this magical home from the ground up, it has given us the chance to create a once in a lifetime experience, which we feel every day that we are here. Sunrises over the hills, a sky of orange whispers, and sunsets over the Golden Gate Bridge, casting a warm and comforting glow upon us, birds in our trees, flowers in our garden, the sense that beauty here is timeless, as we begin to realize that we are not. Sierra Street is the perfect Bay Area getaway--whether you are coming simply to vacation, for a wedding, for your family member at Berkeley, for a conference, or for the wine country, you will find Sierra Street to be a perfect choice among many. We welcome you to see for yourself. Perfect location for walking to all of North Berkeley food markets and restaurants. Beautiful eastern view of the Berkeley hills, the University of California Campanile, and the North Berkeley treetops. A distant view of San Francisco Bay and the Golden Gate bridge on a clear day. Berkeley has strict laws about wood fires and the environment. We do not permit fires in the fireplace for that reason. Wireless Internet access is available throughout the flat. All European appliances with microwave, Cuisinart coffeemaker and toaster oven. Includes bar that opens to the kitchen. (3) Three flat screen LCD TVs--one in each bedroom with DVD player. (2) Two beautiful balconies, one facing the eastern Berkeley hills and the other facing our quiet Sierra Street and San Francisco Bay. Gorgeous light all day long. Perfect North Berkeley home for visiting professors, researchers, and academic administrators. Our hosts were very hospitable. Their home is clean, charming and comfortable. The kitchen was fully stocked, a lovely surprise to have coffee, juice, and fruit for our stay! The location was perfect for our family gatherings. It’s close to wonderful restaurants & shopping. Every evening we took a walk around the neighborhood and enjoyed sunset views from the patio! We thoroughly enjoyed our stay. Accommodations perfect! Especially enjoyed the well stocked kitchen and the hostesses made our stay delightful. Overall, the property location and accommodations were great for my family's needs. Further, the hosts were charming and made us feel welcome. The views were great (in spite of the forest fires) and being in a quiet neighborhood was also an added plus. The only two aspects of our stay that were mildly disturbing were the spotty Wi-Fi network and an image on one of the bathroom shower curtains that was not appropriate for a family visit. Those aside, we enjoyed our stay. Lovely owners. Beautiful space. We have used it twice for family and feel Very lucky to have found this amazing flat. Great place! Good views. Nice neighborhood. Arun and Suzy were kind, welcoming and accomadating. They were great hosts. They have a beautiful home. Charming and clean, great stay! We had a great stay at this charming Berkeley 2nd floor duplex. The owners were very helpful, and even dropped off some fresh cookies for our kids. Location is great, and the kitchen was well stocked with pans, dishes, glasses, etc. Quiet neighborhood. We would stay again! Within 2 miles of the University of California, Berkeley. We offer a discounted rate to couples and individuals who stay at Sierra Street. Their rates are $250/night, $1600/week, and $5,000/mo.